With the increase in accessibility to and advertisements for online colleges, potential students are asking a number of incredibly valid questions. One of the most common questions is about the cost of an online education when compared to the cost of attending traditional schools. This article will answer one basic question: Does getting a degree online save you money? Unfortunately, there is no simple yes or no answer, largely due to the sheer diversity of schools that offer online programs. The cost for these online programs will vary across the board. Traditional universities aren’t clones of one another either, and the college tuition paid to these institutions can vary dramatically. The standard industry cost for an online degree tends to be lower. Then again, you can always have your employer pay for your education. If that was the case, you wouldn’t be reading this now would you? Computer Tolerance: You must like working in front of a computer and are comfortable maneuvering around the internet. Your class time will be consumed with projects, quizzes, tests, emails and lectures online. Non-Classroom Setting: Not being easily distracted by exterior influences from home, library, coffee shop or wherever else you would be studying from. 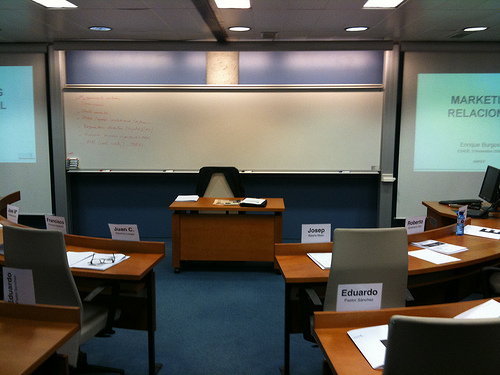 In a lecture hall or classroom, you are expected to focus on the instructor and have little to no disturbances. When you are taking an online course, all responsibilities are on you. Self-Motivation: There will not be a teacher there to hold you by the hand. Will you be able to motivate yourself to turn assignments in and take tests on time? Read up on some college tips and see what you need to do to enhance your educational experience. Accelerated options for online degrees can mean a significantly lower cost, as well. If you are able to devote more time and energy than is typically expected of a student, you may be able to complete your coursework even more quickly. Flexible class start dates, open enrollment through much of the year, and “work at your own pace” environments can all lead to fewer total semesters of enrollment, lowering your costs substantially. The cost of books and other resources is also minimized. Thanks to the presence of so many web resources, ebook versions of your textbooks, and other electronic resources, you will be able to spend substantially less when it comes to books and other documents. Many of these aspects of your college experience simply won’t be an issue with a virtual campus. There are some hidden expenses to online classes, of course, but these are minimal. These costs may include setting up your own focused study area at home. For those who are worried about getting the resources for school, student loans, grants, and scholarships are available for students enrolled in online colleges. Still, there isn’t a set answer as to what option is the cheapest. Local community colleges often offer a comparable price, some online colleges have higher tuition fees, and more colleges are moving toward electronic resources and virtual classroom environments. While the average cost of getting an online degree will tend to be lower, to find the real answer you will have to look into the specific costs of any programs that interest you. This is a guest post by Stephen Cline. Stephen has a dual bachelor’s degree of Business Administration and Finance and has worked for numerous financial corporations in the past 4 years. Taking some time off from the corporate world, he is currently getting his MBA at the University of California, Berkeley. You can visit his website at http://www.economiccrisisblog.com/ and follow him on Twitter. I know one person who did an online degree and it took him forever. Granted he was working full time, but each year there seems to be a tuition increase and over the years his school lost it’s accreditation, which basically makes his degree useless and he really needs to sell himself in interviews on the knowledge he learned without the degree as proof. Based on that experience I’d say if you’re looking to save money – check out a community college. I’ve been thinking of doing a degree in ecconomics from the university of london. I think online enducation will be a real democratizer of eduction. Kids from the ghetto will finally be able to get degrees and the only thing seperating them from the middle class will be hardwork. I would say that Online Education and Degrees should be carefully monitored and then stepped into. Online Education does not mean that you obtain your Certificate,it can also mean that you develop your knowledge apart from going to a good College whichever you like. It actually helps to increase your knowledge.It is the best way to grow yourself Mentally. I love the honesty in this article, especially the three points about attending schools online. But as the years have already shown,and the revolutions in education technology, there seems to be a huge trend for online education in general. I have a feeling that online and traditional colleges will soon be on the same playing field.